Fantastic Side Addition to a Wonderful Series! One haunting sentence, perfectly describing the entire underlying struggle in this book. A story full of tension and suspense, and completely finger-wringing worthy. 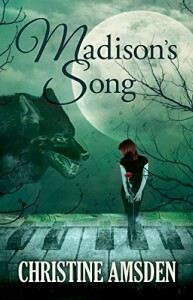 Madison was a remarkably mysterious and interesting side character in the Cassie Scot series. She was an important piece of that chess game, and it's wonderful to read more about her, exploring what happened after the dramatic ending of Cassie's story. She was the character I found myself identifying with the most in that series, and was eager to have the opportunity to read more about her. Scott was the same way. I felt intrigued by his character, and kept hoping he would be explored a bit deeper during the original series. I love that they have their own story now, and a final conclusion to their connection. Understanding them each a bit more adds depth to the original story line, and answers several questions previously raised and left unanswered. The book starts out intense, and honestly made me slightly uncomfortable and overwhelmed. No light or subtle preamble about it, simply thrust into the depths of anguish and heartache. We dive into the tormented lives Madison and Scott have each endured both before and after an agonizing turn of events, that leave the pair in excruciating pain. The desire to feel both compassion and judgment for them is overwhelming, quickly pulling you into the raw emotion of this story. I would definitely say this is a book for upper Young Adult, or New Adult readers. The entire book is intense, with constant scenes of gore, violence, and mature content, as well as sexual scenes which, while not entirely graphic, are intense and overwhelming to the reader, leaving little to the imagination. The mixture of religious themes from Catholicism, completely intertwined with supernatural (and unnatural) creatures, magic and folklore may also make some uncomfortable, but is a core part of this story. Christine Amsden is definitely a writer with superb talent, and I've enjoyed every book I've read from her. She is a gifted storyteller, never failing to pull me into her stories, connecting me with the world she's created, and the characters living, fighting and dying there. This book is probably one of my favorites from her so far, and it has certainly left it's mark on me. The ending though - agh, the ending!! Exactly the opposite of what I was hoping for, but most likely what Madison would have wanted. It did leave me feeling a bit let down honestly, after such an intense and emotional book. An anticlimactic finish to thirty four chapters of build up and suspense. Having such a disappointing ending however, is really the only thing I didn't like. It's a wonderful read, especially for fans of this series. I think a lot of the depth would be lost on someone reading it without first devouring the Cassie Scot series, and while the majority of the back story is explained, it would be difficult to follow if you don't know the original story. It is a book I'd recommend to anyone, however, and I think can be enjoyed by any fan of this genre. *I was given an eCopy of this book, from the author, to read in exchange for an honest review.